Even those among us that claim not to have an actual bucket list have a general idea of the big places we would love to travel to someday. It's there in the back of our minds. Who doesn't want to see Santorini? But then what? Here's a list of destinations you might not have considered that have the potential to thrill and enthrall almost as much as the bucket list hot spots, or perhaps remind you a little of the things you've seen at the top of your list. You may even want to reverse the order and see some of these places before you finish that imaginary list. Rome is big and busy. Sure, it's a must see, but you may find Milan equally enjoyable. The traffic isn't as bad because Milan has an amazing train system to get you around town to all the sights. The stunning Duomo and Galleria Vittorio Emanuele are the tip of the iceberg of things to see and do in Milan. These two cities top so many bucket lists that they are having trouble dealing with the large numbers of tourists. The Canary Islands are a part of Spain that many American tourists ignore completely. The largest of those islands, Tenerife has a wide array of things to see and do, including a dormant volcano, black sand beaches, and UNESCO World Heritage Sites. Cross the Hollywood sign, Malibu, and the Santa Monica Pier off your list, then head north to the quiet beauty of Oxnard, Ventura, and Simi Valley where you'll find less crowded beaches, stunning ocean drives, fields of strawberries, adventure in the Channel Islands National Park, and the Ronald Regan Presidential Library. Sure, Santorini is stunningly beautiful, but because the island is flooded with tourists, there is a distinct lack of connection to the people of Greece when you are there. For that reason, after you have your fill of photogenic Santorini, venture to Limnos. With its quiet fishing villages, friendly shopkeepers, and extreme lack of American tourists. Have no fear, there are still adorable seaside eateries, colorful beaches, and plenty of history to enjoy. This sounds a little backward since you must cross Key Largo on the way to Key West unless you are flying to the iconic island at the end of the Florida Keys. Key Largo and the rest of the Upper Keys are often forgotten by tourists in their rush to head south. Slow down and consider spending time on Key Largo. Enjoy fishing, boating, watersports, and amazing scuba diving and snorkeling at John Pennekamp State Park. Playa may be your ultimate dreamy Mexican beach resort town, but after you've been there and done that, consider jumping to the West Coast of Mexico to try out the beaches and fun in Puerto Vallarta. All the water sports, shopping, and luxury resorts are there, but they come with an international food scene that is hard to top anywhere, all set against a backdrop of lush green mountains. We can all agree that Alaska has things that you cannot see anywhere else in the country, but after you cross it off your list, be sure to add the only national park in the state that has the highest concentration of peaks reaching over 14,000 feet other than Alaska. You may not be able to see glaciers and whales or fish for salmon in Colorado, but the national park has enormous herds of elk, tundra, and great trout fishing. The hike up the Acropolis to see the ruins in Athens is almost impossible to top as far as amazing experiences go. 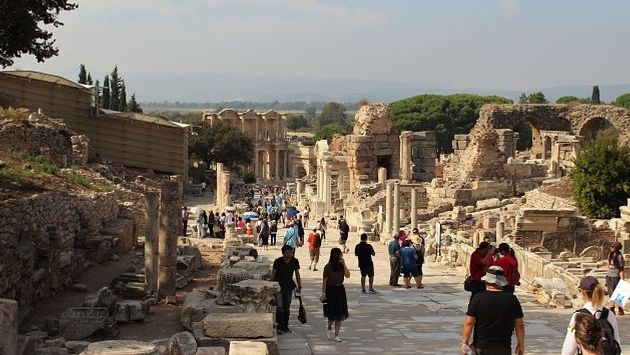 The ruins at Ephesus outside Kusadasi, Turkey come close. The famed Library of Celsus is a tiny fraction of one of the largest archeological sites from the Greek and Roman empires. Hawaii is Hawaii and there is very little that compares with the experiences you can enjoy there, but it's a big expensive trip. If you need a quick island fix that doesn't break your budget, consider Santa Catalina Island off the coast of California. It has glitzy Hollywood history, hillside lodging, beaches, hiking, kayaking, scuba diving, and a zip line adventure with five lines, dropping over 600 feet in total elevation. After you've stood in the center of Times Square, hiked to the top of the Statue of Liberty, and seen all that Broadway offers, you need a quiet place to decompress. Roughly an hour and a half from the city, you can have an experience that is the total opposite of Manhattan's sensory overload at Mohonk Mountain House. This charming hotel from a bygone era perches next to a beautiful glacial lake. Enjoy hiking, swimming in season, spa treatments, and the quiet of the mountains. If Aruba is the playground of the party crowd visiting the deep Southern Caribbean, its neighbor Bonaire is its polar opposite. Sharing the same Dutch roots, the two islands are linked by culture and history, but not much else. Bonaire is known by scuba divers around the world for its well-protected coral reefs, but it is quickly becoming a hot-spot for visitors looking for nothing more than secluded beaches and turquoise water. No other state can boast even a close second to California's wine production, but the Texas Hill Country has the makings of a destination that rivals Napa. Besides wineries, the region has lavender farms, olive groves, peach orchards, quaint towns, and more B&B's than you could try out in a lifetime.